Sandi's Creative Connection: This Card is a Winner! Roll out White Simply Pressed Clay thin. Stamp the "1" image in Bermuda Bay ink on the clay. Set the clay aside to dry for 24-48 hours. Once the clay is dry, trim it to the desired size and shape. Adhere a piece of Gingham Garden Designer Series Paper to the Whisper White card. Cut a notched edge on a strip of Whisper White Cardstock using the Big Shot and the Finishing Touches Edgelits Die. Adhere the Whisper White piece to the card. Stamp the "The winner" image repeatedly in Coastal Cabana ink on Coastal Cabana Cardstock. Adhere the stamped Coastal Cabana piece to the card so the notched Whisper White edge shows below it. 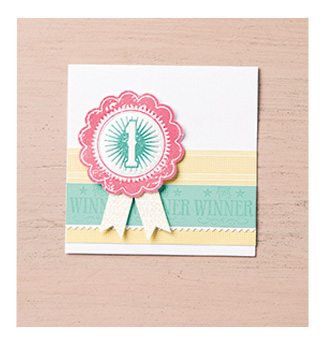 Stamp the "Congratulations" ribbon tails in Daffodil Delight ink on Whisper White Cardstock and cut them out. Adhere them to the card using Stampin' Dimensionals. Stamp the full ribbon image in Strawberry Slush ink on Whisper White Cardstock. Cut out the scallop circle portion. Punch out the center using the 1-3/8" Circle Punch. Apply Dazzling Details around the center circle. Adhere the clay piece to the card. Then adhere the scallop circle to the card over the clay piece using Stampin' Dimensionals.